Beatrice L. Milne, 100, a long time resident of Calvary Homes in Lancaster, passed away on Monday, February 4, 2019. 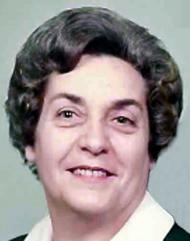 She was the wife of the late George Stanley Milne, Jr. who passed away in 1994. Born in Philadelphia, she was the daughter of the late John W Fielding, Sr, and Rebecca (Barger) Fielding. She was preceded in death by her brother, Jack and sister, Emma. Bee had been a homemaker and had served as secretary for her husband’s custom home building business. She also worked for State Farm Insurance Company, in Springfield. She was a long time member of The Blue Church in Springfield, PA. She served as a Girl Scout Leader for many years. Bee enjoyed all types of crafts. She especially enjoyed Scherenschnitte, the art of designs from intricate paper cutting. She also loved games with her Friday evening group, as well as doing puzzles. Bee is survived by her daughters: B. Carol Wardell, wife of Ron Wardell of Lititz and Shirley A. Minitelle, wife of John A. Minatelli of Mt. Dora, FL. Also by her grandchildren Todd (Dawn) Wardell, Heather (Steve) Hahn, and Andrew Minatelli. She has 9 great grandchildren: Lee, Alex and Kelsey Wardell, Kerri and Melanie Hahn, and Sophie, Gabi and Max Minatelli. Bee’s Memorial Service will be held at 10:00 AM on Friday, February 8, 2019 in Fellowship Hall at Calvary Homes, 502 Elizabeth Drive, Lancaster, PA 17601. In Lieu of flowers, contributions may be sent to Calvary Homes Benevolent Fund at the above address. Her family wishes to thank the staff at Calvary Homes for their loving care of their mother.